It's another long post with not a lot of pretty pictures but packed with useful information for me. First the overview shots from the hillside. 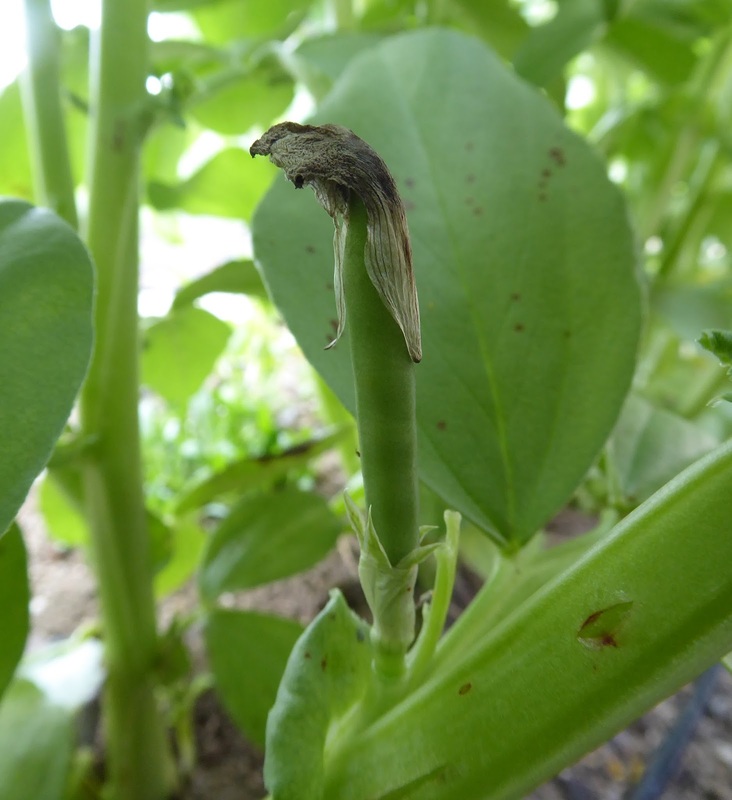 Favas dominate Bed No. 1 and cardboard dominates bed No. 4. Of course the cardboard covered bed is a magnet for accumulated stuff already. Bed No. 2 is dominated by the hardware cloth cage and yards of hardware cloth surrounding the rest of the bed. More cardboard is laid out over Bed No. 3 which is protecting the parts of the bed that I cleared out and where I dug in amendments and compost this past week. The much anticipated atmospheric river is finally just this afternoon starting to unload some of its load of moisture on us which is why I covered the soil. I didn't want heavy rain splashing the soil all over the place and pounding the surface. One of the interesting things I learned about atmospheric rivers is that they can carry vast amounts of moisture aloft and over your head but just because they are passing over doesn't mean that a drop of rain will necessarily fall on your head. It requires a combination of factors that I can't explain to force the moisture out of the airborne river and in the earthbound rivers. So even though the AR flowed our way last night it didn't give up an appreciable amount of rain until this afternoon. This is where the tomatoes and peppers grew in 2017. There's still a few lingering pepper plants in one corner including Aji Amarillo Grande, Aji Golden, Joe's Giant Aji, Baby Aji Amarillo, and Aji Angelo. 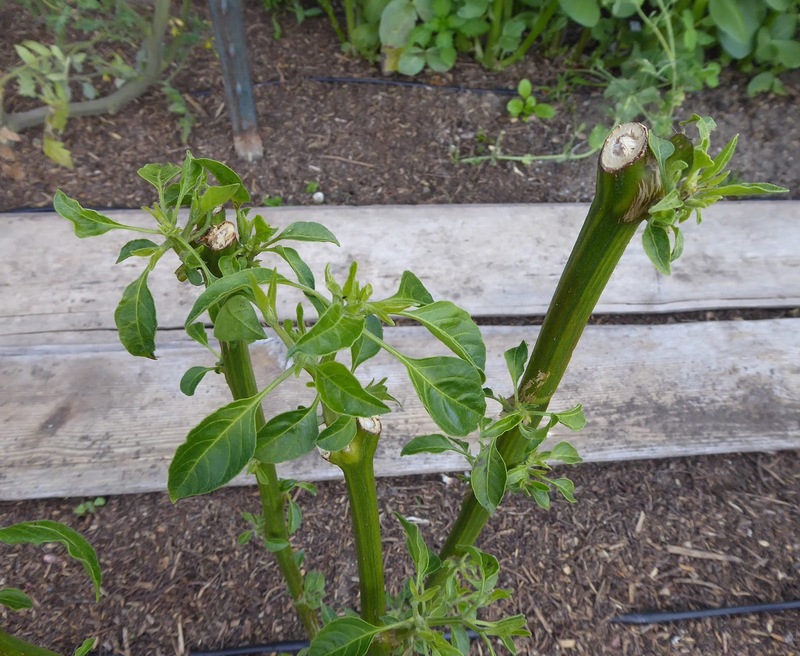 The Aji plants, all Capsicum baccatums do tend to be quite hardy and will often overwinter with a little protection. I've found that there are some Capsicum annuum peppers that can be overwintered also and there's a few here also including an Ethiopian Brown and a couple of Craig's Grande Jalapeño. Aji Angelo is particularly ready to get growing again. I cut back all the pepper plants last week, scattered a bit of my usual amendments on top of the soil and covered it all with some sifted compost. I also gave the plants a diluted shot of liquid fish fertilizer and Azos bacterial inoculant and then sprayed them with Serenade to hopefully kill off any overwintered fungal spores. And then they got a shot of Pyganic and Azadirachtin for aphids when I treated other plants in the garden for aphid infestations. And then I gave the Piccolo Dattero cherry tomato plants the same treatment. 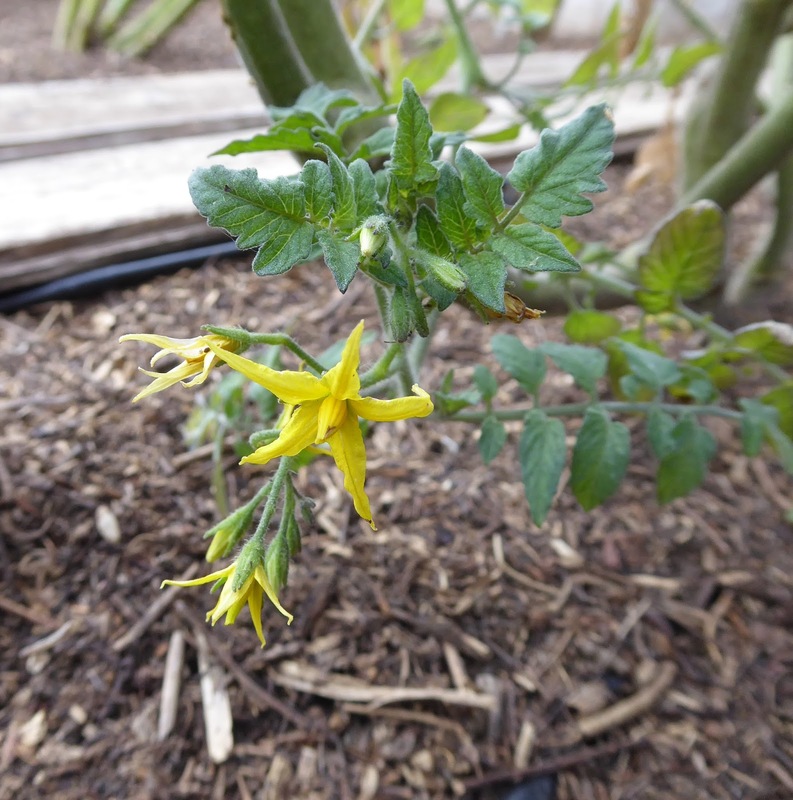 This is the first time ever that I've left tomato plants in the garden through the winter. I have no idea if they will get growing again but it's fun to see what will happen. I'm just amazed that there's any life left in them at all. The fava beans are growing and seem to be right on schedule. I'm really pleased that they don't seem to have been at all set back by being started in paper pots. Actually, I think I'll be starting them in paper pots again next year because they germinated much more quickly and I lost not one single seed to rot nor a single emerging seedling to sow bugs. The flash tape seems to be doing the intended job of keeping the birds from snacking on the tender young leaves too. The plants are covered with blossoms. And I spotted the first baby bean! The Golden Sweet snow peas that I planted along the other side of the trellis are starting to bloom too. So far so good for my experiment of growing the two together. The biggest problem has been protecting the young pea seedlings. 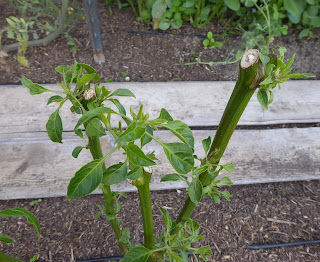 Most of the pea plants at the other end of the trellis got munched pretty hard by birds and/or voles and perhaps a rat. Also in the critter resistant cage - Little Crunch snap pea plants slowly growing. And Royal Snow Pea plants growing a bit more quickly. Not much has changed in this corner. There's still a couple types of cabbage under the cloches and Pink Lettucy mustard pushing out shoots in the corner, surrounded by baby Cilician parsley which is just getting to be big enough to harvest. The other cloches in the back are new, those are protecting seedlings of Yellow Cabbage Collards which took the place of the Pixie Cabbage that I harvested last week. Inside the cage are the last heads of Three Heart butterhead and Red Iceberg lettuce and a volunteer head of lettuce that I'm not sure what it might be, Devil's Tongue perhaps, I let it go to seed once upon a time and find it popping up now and then. And coming along are a bunch of Queen of Crunch lettuces and a couple of Tennis Ball butterhead lettuces. Speedy arugula is getting back up to speed with the warmer weather and longer days and a bit of rain doesn't slow it down either. The Greek cress is just poking along though. And a volunteer parsley plant that I left behind when I cleared out the bed before is bolting - gotta go. Sorry looking radish patch with patchy germination and nary an interplanted fennel shoot to be seen. Beets seem to be happier after a spritz of aphid killing Pyganic and Azadirachtin. I might get a few Italian Scallions soon. There's a second succession on the right. I set them out in trenches that I fill in as they grow to force them to develop longer shanks. I just sowed a third succession in a pot a few days ago. Ho Mi Z/Dragon Tongue mustard is a bit crowded but I think it's still ok. Double protection for the new Batavia broccoli seedlings. The Beni Houshi mizuna is less of a target for the birds but it didn't seem happy in the heat that we had last week. Another Pixie cabbage from the reserve plants. It got a bit stunted from being in a 3.5-inch pot before I put it in the garden but it's forming a head and I've got it inside a hardware cloth cage to keep the birds from pecking. Critters! The birds also attacked the first Pai Tsai Chinese cabbage that I set out so I put the reserve plants in the garden with extra protection and wouldn't you know it, they decided to bolt already. Oh well, that makes room for something else. Still waiting for these to bolt. Funny how when you want something to go to seed it seems to take forever. I'm working on getting this bed cleared out and ready for mostly curcurbits and it also seems to be the bed where the potatoes are going to grow. The greenery sharing space with Sweet Alyssum in the corner is Cilican parsley that shared space for most of a year with Batavia broccoli. I forgot to mention that I just scattered Cilican parsley seeds around the new Batavia broccoli plants in Bed No. 2, it seems to be a happy union. Anyway, the parsley is finally bolting so I should be able to renew my stock of seeds. I love that parsley. Chard is slow to bolt in the spring here. This patch of Special Baby Leaf chard will yield one last generous harvest when I clear the plants out, hopefully next week. I keep whacking back this Orion fennel and it just keeps coming back. There isn't time left for it to form another bulb before I have to dig out the root. But, hmmm, what if I just left it there and planted around it? I'll figure that out when the shovel hits the dirt next week. One more lingering overwintered veggie got spared. These Kalettes weren't too hideously infested with aphids so I gave them a good trim and a spritz of aphid treatment and I'll see what happens. If nothing else I think the leaves might be used like kale. And in another corner of the bed are some Pink Plume celery plants that are growing from side shoots that I pulled off of the main plants and just stuck in the ground a couple months ago. They are growing and aren't showing signs of bolting like their parent plants did. As I said before this bed is dominated by cardboard which is covering the mustard based cover crop that I whacked down a while ago. But one end of the bed is home to the overwintered Frieda Worlds snow peas. There's a bit of yellowing going on in one section but other than that the plants are still looking good, blooming, and setting more peas. Oh these have been so good. I definitely have to try overwintering more of them again next year. I also tried overwintering low growing peas but they didn't do as well, although I did get a few harvests of pea shoots. Next year I'll grow a short variety strictly for shoots. 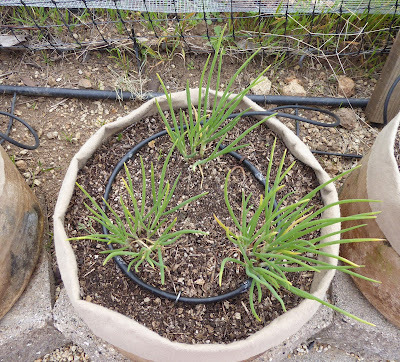 Ok, the only thing left is a look at the I'itoi onions which seem to be slowing down a bit and showing signs of yellowing. I gave them some food and extra water and will see what happens. They are a fun crop to grow and I'm still learning how to do it right. So much is going on in your garden. It's amazing how good your overwintered snow peas look. Our greenhouse is filled with plants, but most of the things that overwintered in the garden have bolted. I can't wait for spring planting to get underway. The snow peas have been a special delight this year. It's actually been a leaner spring than usual so I'm appreciating the peas more than ever. It is nice to see a garden that has something growing in it! Mine got a dusting of snow this morning. My container baccatums are ready to get growing again too. I have one Aji Angelo plant I started back in 2016 that I'm going to try and get a third season out of. I'm also growing the Beni Houshi mizuna and it will likely see some heat here too this spring. Our weather is likely to go straight from winter to summer, since spring seems to have bypassed us. I hope the AR gives you some beneficial rain. Snow! Yikes! My garden is feeling the love of an inch of rain! And when I went for a hike this morning I found that the wildflowers have responded in kind. California poppies are making orange splashes across the hillsides. It's a joyous sight. I love the idea of overwintering pepper plants. I have a feeling you'll be getting some early harvests this year - with the tomatoes as well. I haven't even seeded mine yet - that's a task for next week. 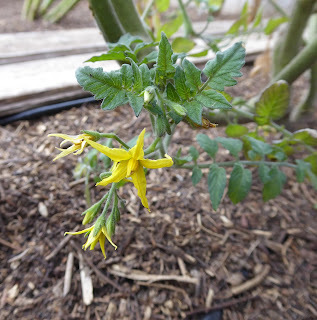 I doubt I would ever be able to overwinter tomatoes in my garden, even if temperatures would allow it. They are usually on their way to succumbing to disease by the time they are hit by that 1st frost. Well, I don't count on any kind of harvest until it happens! My tomato seedlings have just emerged and don't even have true leaves yet. I'm in that anxious stage with the peppers waiting for them to germinate. What is the variety of fava beans you are showing? Mine have the same blossom but were just labeled "fava bean" in the 6-pak I bought from the nursery. Radishes are always a total failure for me, never making a bulb. Year after year I keep trying to no avail. The last bunch I bought from the market was pretty good, though, but the tops were too ratty to use. You haven't washed away yet I see. Funny about the radar echoes. It sometimes looks like it is raining hard, but that is not so on the ground. Most fava varieties have the same flowers so that's not a great indicator of what one you have. That variety is Extra Precoce A Grano Violetto (Extra Early Purple Seeded) from Baker Creek. I've been growing it for a number of years because it is early and it doesn't get to be too tall and floppy, and the beans are great. I usually get pretty good radishes in the spring and I'm learning how to do the winter type radishes that can only be sown in the fall here otherwise they are guaranteed to bolt. China Rose radishes are ok to grow to overwinter or in the spring but the best thing about them in my opinion is that even if they don't make great roots the tops are always good because they aren't as prickly as most radish greens and they are big. We actually got over an inch of rain over Friday night and into Saturday. But yeah, it wasn't quite the gully washer that it was hyped to be.